When most of us think about a calorie-torching workout, we think of two words: hard work. We think of activities like jumping, sprinting, bootcamp, and HIIT. On the other hand, people tend to think of gentler, low-impact workouts as "easy" or just "what you do when you're injured." The truth: swimming, rowing, and other easy-on-the-joints activities can be just as sweat-inducing as their more "intense" counterparts. In fact, certain low-impact activities can actually lead you to burn more calories. 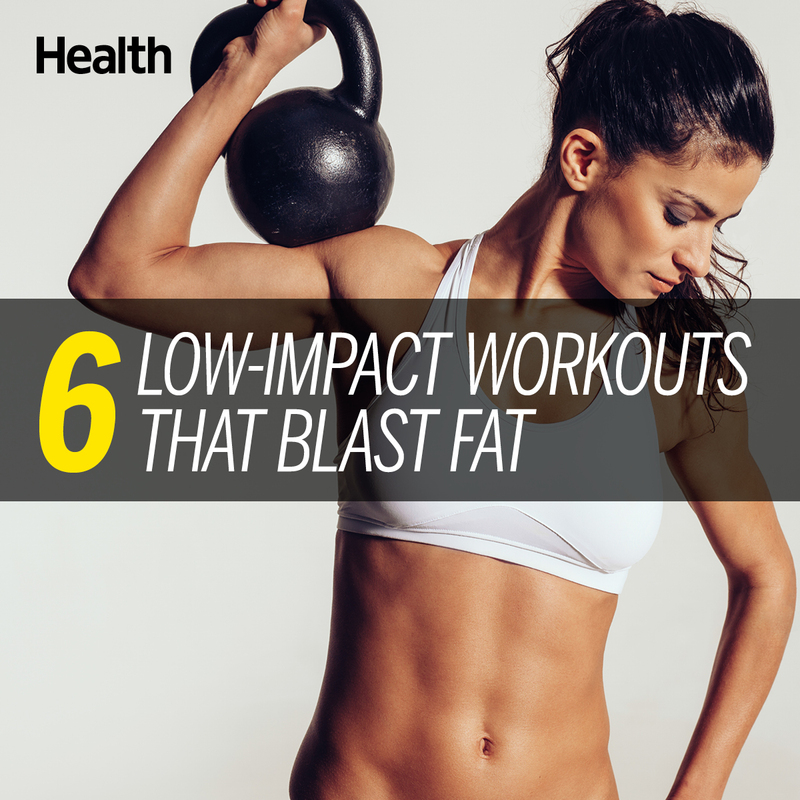 Here's how to get the most burn for you buck with my top 6 low-impact workouts that blast fat. You'll use your legs, back, and arms simultaneously while using a rower. It's important to have good form on this machine (or else it will blow your burn), so make sure to master the flow first. If you need help, don't be shy about asking the gym staff for help. There's a reason we envy all of the swimmer's bodies come Olympics time. Throw on some goggles and hop in the pool. What is a Versa Climber? It's maybe the hardest piece of equipment at your gym, and yet it's still easy on your joints. The Versa Climber mimics climbing a steep mountain or scaling a wall. What to do: Step on to the machine, and start climbing. If you can last 5 minutes, you're doing better than most. The key here is to pace yourself and stay on as long as you can. Rest 2 minutes and repeat for 3-5 sets. If you haven't jumped on the kettlebell bandwagon, now's the time. This versatile piece of equipment gets your heart rate up, improves strength, and in the process, burns a ton of calories. What to do: Kettlebell classes are trending right now, with most gyms offering them. You can also try my workout for beginners at home. This gym tool is a must. Usually found in the weight room, the TRX handles may look intimidating at first. But mostly that's because it's unclear what to do with them unless you're taking a class or have a personal trainer with you. Here are three basic moves to get you going. 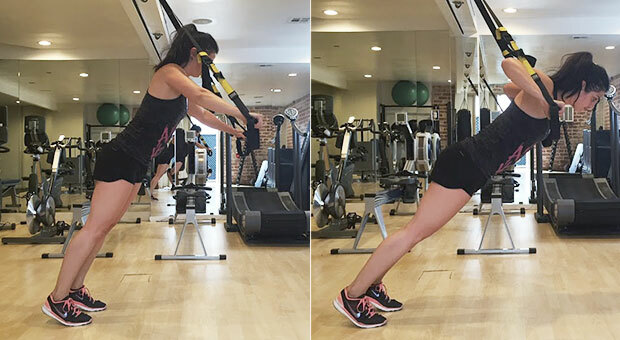 While holding the TRX handles, walk yourself down as far as you're comfortable with. Keep your hips high and allow your body to hang with your arms straight. While maintaining this position, pull yourself up until your hands are next to your chest. Make sure to keep your body moving as one unit. Lower yourself back down and repeat for 10-12 reps. While holding the TRX handles, lean into the TRX with straight arms and hover over your hands, keeping your body at a diagonal angle. Slowly lower your body downÂ and then push yourself back up using your arms and chest. Repeat for 8-10 reps. Stand up straight holding the TRX handles. 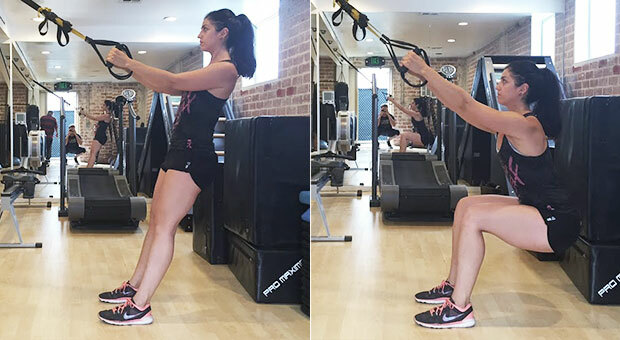 Using the TRX as a counter-balance, squat down as low as you can and then come back up to standing. Repeat for 12-15 reps.
Calorie counts are estimates and were taken from the MyFitnessPal app.